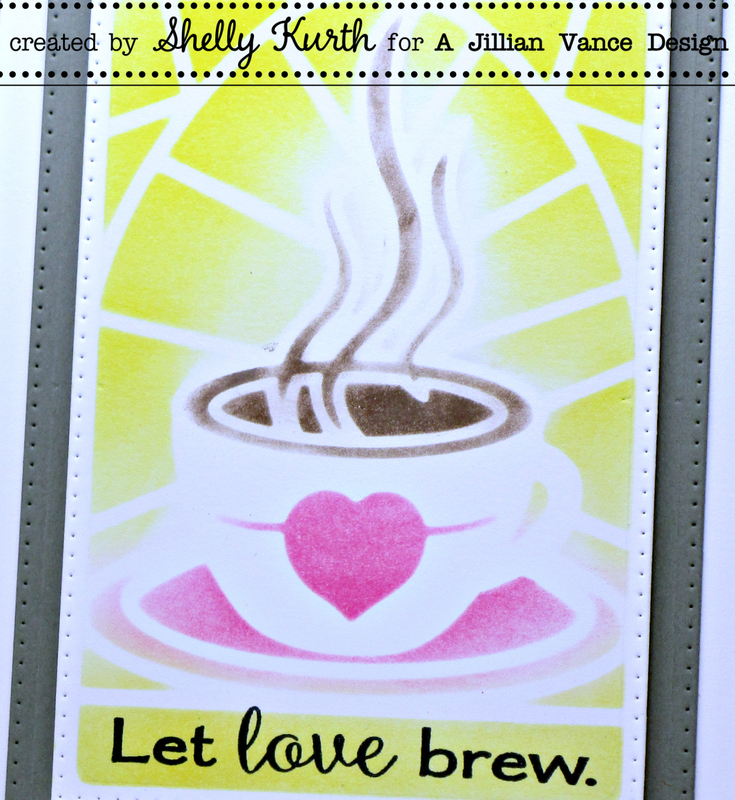 A Jillian Vance Design: Spring Coffee Lover's Blog Hop! Spring Coffee Lover's Blog Hop! 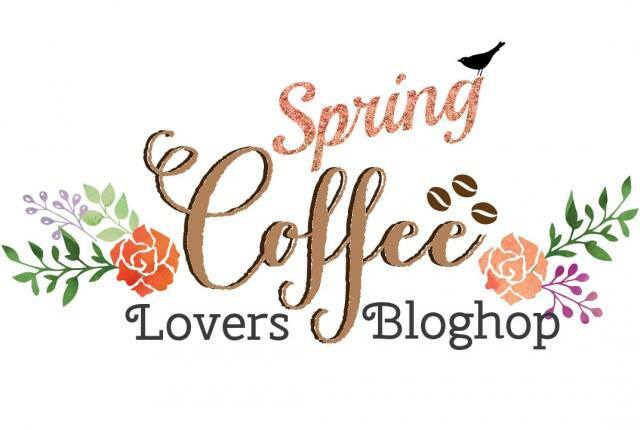 Today is the start of the Spring Coffee Lover's Blog Hop!! A Jillian Vance Design is a sponsor, as well! So, I have a fun coffee card to share with y'all! I used the new Grandpa's glass die! To finish my card off, I used the Polka Dot Rectangle die with my stenciled image and then added my sentiment. Enjoy your day and hope to see you hopping along! Shelly, this is so pretty! Really lovin' that new set! Love your new set Shelly, card is fabulous...love the look of that stencil! Thanks for being a Super Sponsor! Have a terrific Friday! Thanks for being a sponsor of the hop! Awesome card! totally AWESOME!!! love how you used the die as a stencil!! Lovely Spring card,great stamp and die. I love it! Great idea!! Thanks for being a Super Sponsor and love this card. The bright yellow is the perfect pop of color. Great idea for stenciling...I'll have to try it. 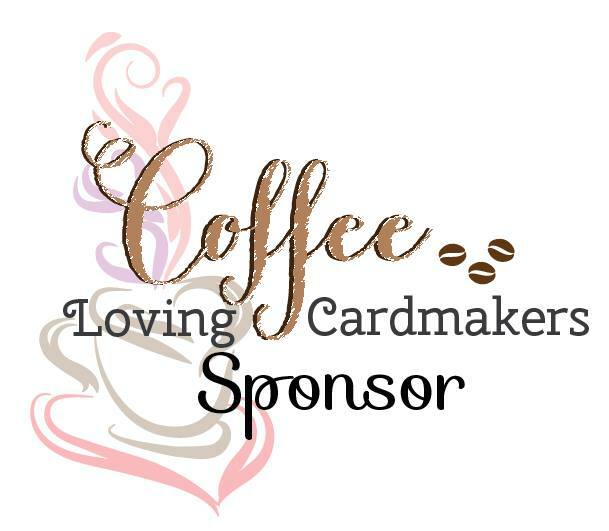 Thanks for being a Super Sponsor for the Spring Coffee Lovers BlogHop. Lovely inkiness Shelly! LOVE the NEW A Jillian Vance Designs! Beautiful set , I love the colors you used and the design is so pretty. Love your creativity, Shelly! Great spring colors! What a wonderful card! Love the sponging! So pretty, Shelly! Love that this is a stencil!!! Your new die is just wonderfull, reminds me of a window at my grandmother's house with all kinds of glass-colours. Like the card you made with it. very clever use of that set! Thanks for sponsoring. What a cool die. gives a great stained glass look. Love the card. Great card and I love those sentiment stamps! - Thanks for being a sponsor! Love the stenciling - very nice! What an amazing set! Love what you did with it! Thanks for sponsoring the spring hop!! Wow!!! Amazing card!!! I love the colours!!!! Love the yellow and pink color combo. Thank you for being a super sponsor!!! Love your stained glass card. Great polka dot die! I must have one!!!! Wow, that stenciling totally perks, er, packs a punch! Thanks so much for sponsoring. It's appreciated so much! Fabulous card! thanks for being a sponsor! What a beautiful card. Love how you made a stencil with the die cut! Thank you, AJVD, for being a super-sponsor for the Coffee Lovers Hop!! oh my word this is AWESOME.. i totally love it Shelly. That's a great die! Lovely card as well. Thanks for being a sponsor! Fully Awesome Shelly! For some reason I've got "these are grandpa's glasses" fingerplay in my mind now. Is there a "grandma's glass" die? Love how you created a stencil. Great colors! Thanks for being a sponsor! Thanks for being a Super Sponsor for this hop.Thanks for the fabulous cards with Beautiful Products too! What a pretty card. I love the stained glass behind the cup. Thanks for being a super sponsor. So beautiful...love that stained glass. Great technique using the die as your stencil. Nifty! Beautiful! Thank you so much for being a sponsor! Gorgeous sponging! I love the combo of that vibrant yellow with that pink. Thanks so much for sponsoring the hop and helping to make it even more fun for the rest of us! Fun colors and great way to use this die. Oh, super fun coffee card!! LOVE the die! Thanks so much for being a Super Sponsor and making this hop even MORE fun!! So pretty! Thanks for being a super sponsor! Beautiful! Love that sentiment set and how beautiful that coffee die is... gorgeous! Thanks so much for being a sponsor! Awesome stencil, latte love here, thanks for sponsoring. What a great idea. I loVe your wonderful card. Thanks for sharing. Love your card and great technique! Oh Shelly, this is so darling! Really love that new coffee set! Beautiful! I can smell that coffee. Love the colors. Oh my gosh! I just LOVE how you did the steam on your card! the die as a stencil! WOW - your stencilling with the die cut panel looks MAGICAL - LOVE IT!!! 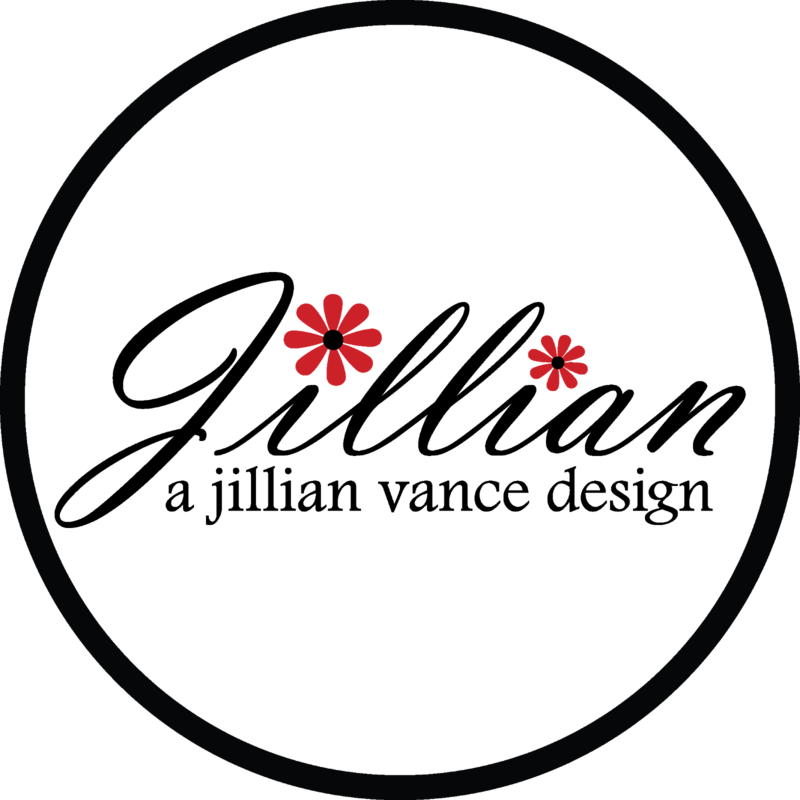 Sending a big THANK YOU to Jillian Vance Design for being a SUPER Blog Hop Sponsor too!!! Such a pretty card! Love those cheerful colors together. Thank you for being a sponsor. Your colors are beautiful. Love the steam. I just love the colors of your card!! Such a fun card for such a fun hop!! Wow! 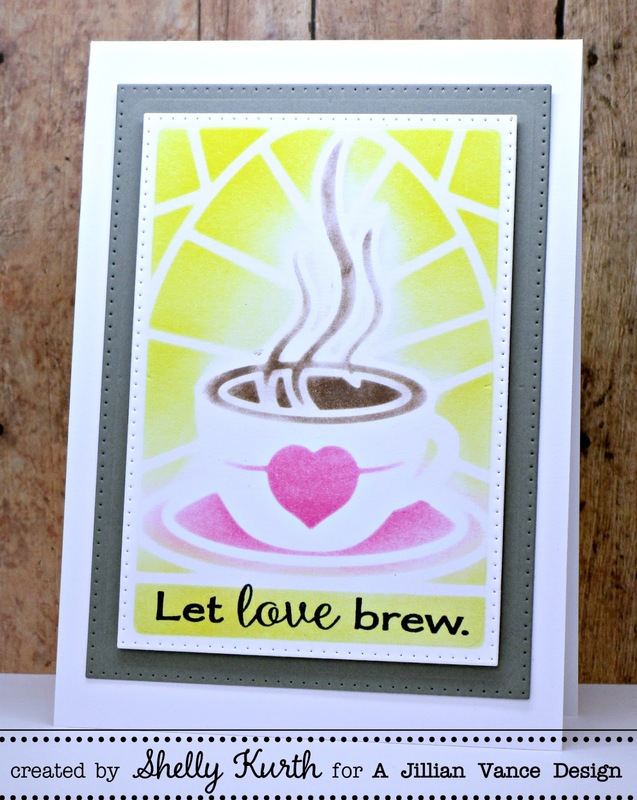 The Granpa's Cup die is fabulous as is your card! Thanks for being a sponsor of this fabulous hop! Oh Shelly, this card is beyond gorgeous!!! So beautifully done! Nice way to use the die. Love how different colors can be added by making it into a stencil. Nice card. Thank you for sponsoring the challenge - I look forward to creating! Your card is fabulous! TFS and have a blessed day! What a unique creation! Thank you for being a sponsor! Eek! I LOVE your card. One of my favorite way to use dies...as a stencil. Thanks for sharing. Love how you used the die as a stencil. This card turned out just beautiful! Wow! what a creative idea! Love the colours on cards too. Thanks for sharing! LOVE this card what a Fun die set!! Fabulous stenciled design, Shelly! Love the colors you've chosen. Such a pretty card. I love how you colored with the steam. Really added so much. Great job!!!! Love how you used the die as a stencil to make your card. Great card love the look of the die as a stencil. Love how you used non traditional colors. Fun card. Love how you created a stencil. The background looks great. I love the new sets and the pretty cards you've created! Perfect for spring! This is awesome love how you used the die!!!! Great set. Love the sentiments. Perfect for us coffee lovers! I love your card it reminds me of stained glass and it pops out at you without having to outline the edges. I LOVE it! what a fun card with the mosaic background, love it! Yay for the spring coffee hop! Cool card. I like the colors. VERY cool effect! Thank you for sponsoring the hop! LOVE x LOVE your card, Shelly! The stenciling is fantastic! Beautiful card! Thanks for being a sponsor! 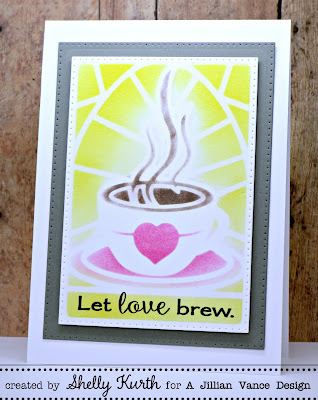 Love the way you used the die and great colors! Fantastic die!!! I think I am going to need that for my collection!!! Thank you for being a sponsor!